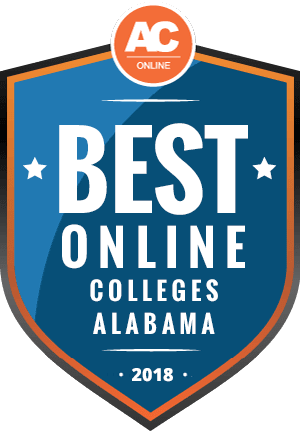 Why Choose Alabama for Online Higher Education? Online colleges in Alabama rank high among national schools for quality and affordability. With 62% of jobs in Alabama projected to require a postsecondary education by 2020, online college graduates continue to support the state’s healthy economy in fields including sales, business, and healthcare. The following ranking includes answers to frequently asked questions regarding enrollment dates and deadlines, transferring credits, and financial aid. Students can choose from many online degrees in Alabama. Nearly 70 programs are offered exclusively online, as reported by the Integrated Postsecondary Education Data System (IPEDS) in 2016. Online programs in Alabama cater to traditionally underserved groups, including workers in shrinking traditional labor industries, single parents, and full-time employees. Generally, online colleges in Alabama offer lower tuition to in-state students than to nonresidents. Students must provide proof of Alabama residency for at least 12 months prior to enrollment to qualify for in-state rates. Out-of-state students in some neighboring states may qualify for in-state rates or reduced tuition, provided the state upholds a reciprocity agreement with Alabama. As illustrated below, in-state students at four-year institutions can save nearly $5,000 on tuition, while students enrolled in two-year programs as Alabama residents can save almost $19,000. Alabama ranks 31st in college costs compared to the national average, and 31st for its economic growth, as well. Nonresidents should look for state reciprocity when researching online schools in Alabama. Students must also confirm the school allows nonresidents to enroll in online programs, because some colleges in Alabama restrict enrollment to select states. As shown below, according to IPEDS, 4,514 undergraduate and 7,499 graduate students complete coursework exclusively online in Alabama. Alabama belongs to the Southern Regional Education Board (SREB), which is the 16-member compact that governs reciprocity between Alabama and its neighbors in the southeastern U.S. SREB prioritizes affordability among college programs through cost-saving initiatives and student-exchange programs, providing nonresident Alabama students deep discounts if they live in a partnering SREB state. Though Alabama does not currently participate in the regional contract program through SREB, other states in the compact offer out-of-state students who are enrolled in health care programs in-state tuition at public colleges, and discounts at private schools. The National Council for State Authorization Reciprocity Agreements (SARA) helps maintain the quality and accessibility of distance programs in the U.S. In Alabama, over 35 colleges and universities offering online programs receive SARA approval. To earn recognition as a SARA-approved institution, a school must undergo a rigorous application process and pay a state fee, dependent upon the number of students enrolled. Selecting an online college in Alabama is an important decision, requiring a lengthy research process. To make the decision easier, we formed these rankings by considering factors like affordability, quality, and accessibility. The following guide highlights these and other notable features of the best online colleges in Alabama. The process of finding the best online colleges in Alabama requires multi-faceted research. Below, we share our answers to common questions regarding costs, credit transfers, admissions requirements, and enrollment. Do online credits cost more or less in Alabama? Tuition for online programs in Alabama generally costs the same as in-state tuition for on-campus courses. Alabama’s colleges and universities typically offer distance learners the same rates, whether they live in state or not. At Troy University, state residents completing a traditional undergraduate program on campus pay $325 per credit hour, while students enrolled in TROY Online pay slightly more, at $338 per undergraduate credit. The state’s next-largest school, University of Alabama (UA), charges all online students the same rate of $364 per credit. Which Alabama schools accept the most transfer credits? Alabama’s largest and most prominent schools offer generous credit-transfer policies. Auburn University evaluates requests for transfer credits on a case-by-case basis, according to transferability to the student’s desired program. Troy University considers transfer students with at least 24 attempted college credits from a two- or four-year institution. Transfer candidates must submit evidence of a minimum 2.0 GPA for all prior college coursework. Troy’s policy does not limit the number of courses a student can transfer, provided the credits were earned at a regionally accredited institution. However, the school does uphold residency requirements for most courses. At UA’s Bama By Distance, advisers evaluate each transfer credit request individually. Generally, students must earn a minimum 2.0 GPA in all attempted coursework and may apply up to 61 transfer credits to a Bama By Distance degree. Will any online colleges in Alabama accept a GED? Most online schools in Alabama accept applicants who earned a GED. UA considers applicants 18 years of age and out of high school for a minimum of one year, with a score of at least 500 on the GED. Applicants must also submit accompanying SAT and/or ACT scores. Troy University accepts students holding a GED instead of a high school diploma, provided the student meets Troy’s scaled GED score requirements. Applicants under the age of 25 must also submit ACT or SAT scores. Auburn University states that, while a high school diploma is required, a GED is also acceptable for admission into a degree-seeking program. How many academic terms per year do online colleges in Alabama offer? The best online colleges in Alabama offer multiple points of entry throughout the year. Students at Troy University can begin an online program during one of five start dates. The state’s next-largest primary providers of online education, UA and Auburn University, follow a traditional semester schedule, offering one start date per term. Which online colleges will accept the FAFSA in Alabama? The top online colleges in Alabama require students to complete the FAFSA as a first step toward assessing financial aid options. The FAFSA is a key element of the admissions process, determining a student’s eligibility for state, institutional, and federal aid. Online schools in Alabama, including Troy University, UA, and Auburn University require students to fill out the FAFSA before applying for scholarships or grants through their respective institutions. Are there any free online classes I can take from Alabama colleges? Some online colleges in Alabama offer coursework through select massive open online course (MOOC) and open educational resources (OER) delivery systems. The University of Alabama, Birmingham-Southern College, and Oakwood University each offer one course through Class-Central.com. While Troy University does not offer free courses online, it created the University Textbook Initiative using the same OER-based system, helping distance students save thousands using open courseware learning supplements rather than traditional textbooks. How can I find the online program options at Alabama’s colleges? Many schools have sections of their websites devoted to distance programs. Schools direct students to online services including technical support, tutoring, and advising through their online learning divisions. For example, the University of Alabama hosts Bama By Distance, a hub for current and prospective distance students. Other large schools in Alabama operate their own online subsites, including TROY Online and Auburn Online. The best online schools in Alabama offer advanced services incorporating the latest in distance learning technology and instructors specifically trained to conduct classes online. Students should research their schools to make sure they understand the application and enrollment process specific to online learning. College-bound students can pursue many financial aid options in Alabama. While every student qualifies for funding opportunities based on their income and residential status, many applicants seeking need-based aid should look to Pell Grants first. Pell Grants are often awarded to low-income applicants and do not need to be repaid. Scholarships are also popular among Alabama students. Here are some of the state’s most popular scholarships. The Treasury Department of Alabama offers this scholarship to high school seniors and first-time college freshman who demonstrate financial need. Applicants must be Alabama residents planning to enroll in an approved program in the state, with a GPA of at least 2.75. Applicants to four-year schools must provide an ACT score of 26 or below; applicants for two-year schools do not need to submit ACT scores. The Linly Heflin Scholarship Fund awards this scholarship to women pursuing an undergraduate degree at a four-year college in Alabama. High school juniors and seniors with documented financial need and an ACT score of at least 23 may apply. Applicants must attend a university accredited by the Southern Association of Colleges and Schools. Recipients must maintain a full course load and a 2.5 GPA to retain the award. Andeavor Companies, Inc. supports this scholarship, which is awarded to high school seniors in one of 18 states that Andeavor conducts business. Applicants must have a minimum GPA of 3.0, financial need, and permanent residency in the state of Alabama or another qualifying territory. The National Association of Junior Auxiliaries, Inc. awards its namesake scholarship to students with residency in a state that hosts a NAJA chapter, like Alabama. Applicants must pursue a graduate program involving direct work with children with special needs in a qualifying field of psychology, counseling, or special education. Students may enroll full time or part time.